Jobie Weetaluktuk is a writer, editor, broadcaster and filmmaker who originally hails from Inukjuak, Quebec, and is now based in Montreal. 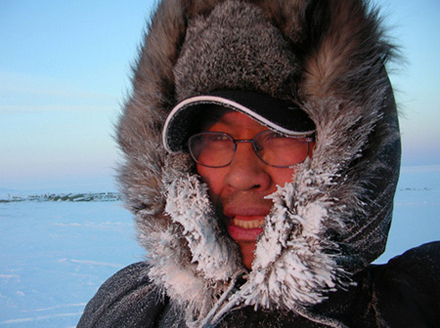 His first documentary film, Urban Inuk (Igloolik Isuma Productions, 2005), follows the spiritual and practical struggles of three Inuit who have left their ancestral homeland in the Arctic for the concrete jungle of Montreal. Urban Inuk aired on Aboriginal People’s Television Network in 2005 and played in over 20 festivals and venues across Canada, the USA and Europe. 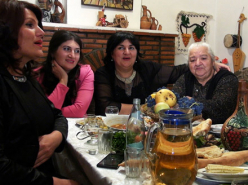 In 2006 the documentary won the Grand Prix, Rigoberta Menchu Community Award at the Land-in-sights First People’s Festival in Montreal, and toured various Maisons de la Culture in that city as part of the Rencontres internationales du documentaire de Montreal (RIDM)’s Coups de Coeur programming. 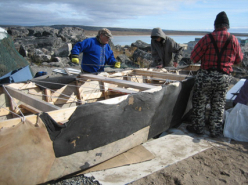 His latest documentary, Umiaq Skin Boat (2008), is a beautiful and poetic 30-minute film about a group of Inuit elders in Inukjuak, Quebec who decide one summer to build the first traditional seal skin boat their community has seen in over 50 years.